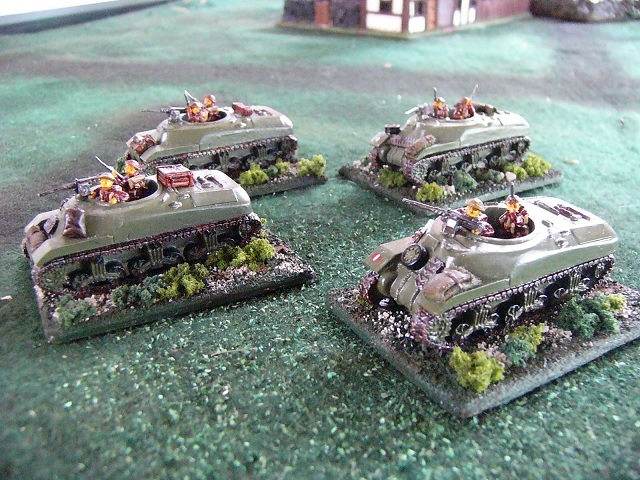 15mm WWII – Stuart Recce Tanks, Kangaroos and Staghounds. 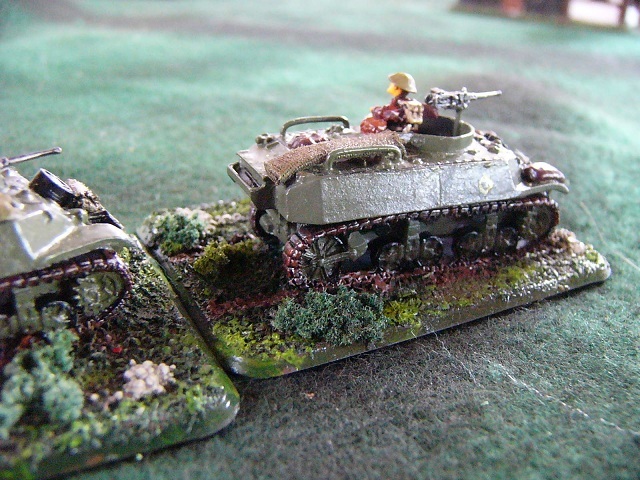 In the years before Flames of War came out we used to be able to by these cool 15mm WWII vehicles made by a bunch of guys who I knew of – some peripherally and others quite well. 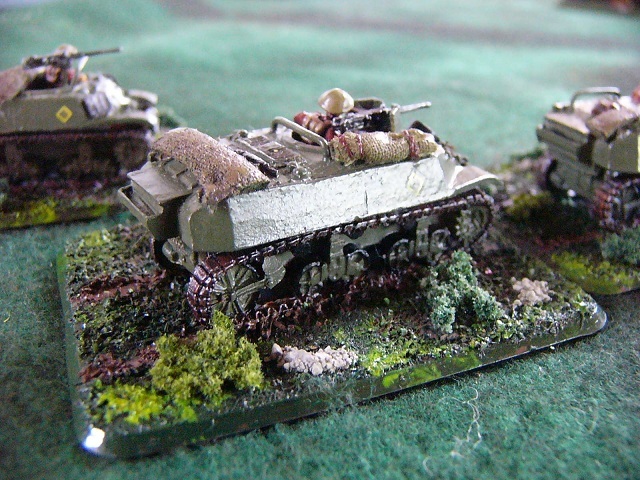 I had acquired a few models here and there but WWII wasn’t my war-gaming period so it never went beyond that. Then along came Flames of War and a revival of this period and like many others I got quite excited about it. Not the least of reasons was the fact that it was a local company doing good on the world gaming scene. 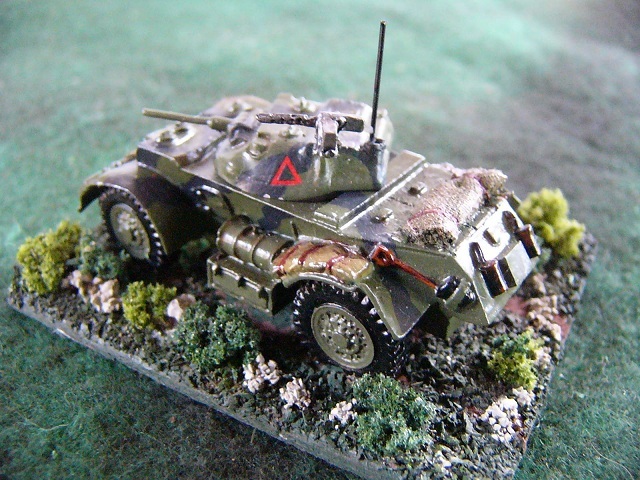 I decided to build a New Zealand force to represent the units that my father and several uncles served in during the campaign in Italy 1943-45. So I began to collect miniatures to represent elements of 22nf Infantry Battalion, Divisional Artillery, Div Cav and 19th Armoured. My Uncle Stan was in the Divisional Cavalry and I always liked Staghounds. 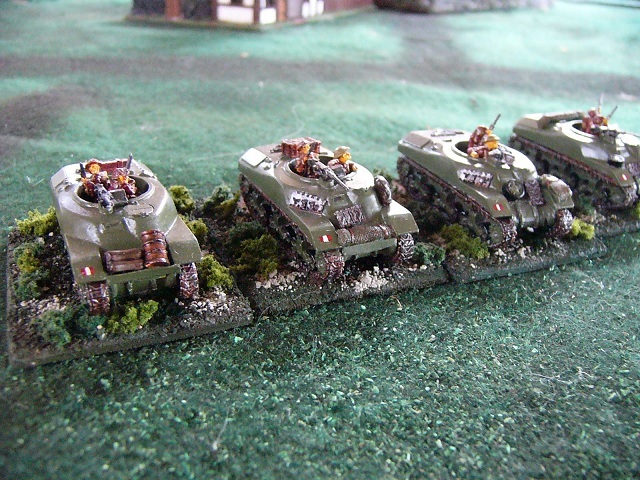 These models are 15mm Old Glory (Command Decision Code CD-116). These particular Old Glory models are great. I like the heft of the full metal model. Based on a standard Flames of War large base with some additional stowage. I have a couple of excellent little reference books by Jeffrey Plowman and Malcolm Thomas covering New Zealand armoured forces in the Second World War. 4th New Zealand Armoured Brigade in Italy and 2nd New Zealand Divisional Cavalry Regiment in the Mediterranean and there were several photos of Stuart Recce tanks. I really liked the look of these so decided to model a few. This one has a homemade gun-shield to protect the gunner (reference is photo on Page 11 of 4NZ Armoured Brigade in Italy) showing 20th Armoured Regiment Stuart Recces near Trieste, 1945.
and another view of same. 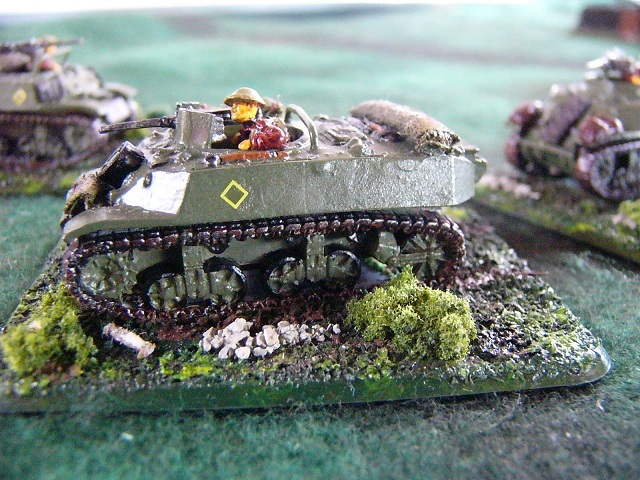 These models were just standard Battlefront Stuart V minis (Code BR0009) without the turret and some bits and bobs added to make them look a little more lived in. 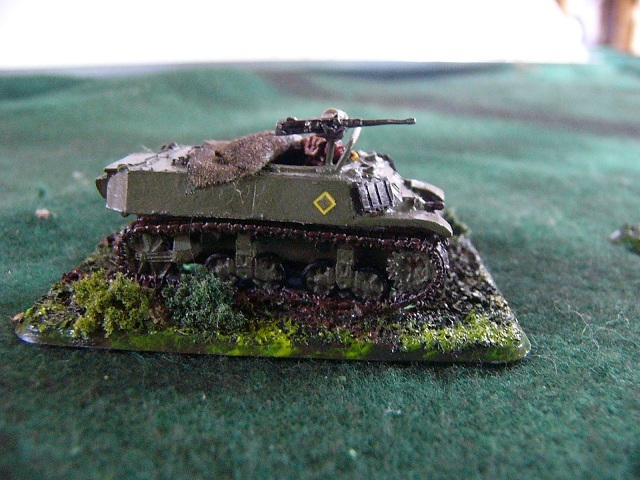 I thought that the canvas cover on this model came out quite well considering the scale. Finally, Dad used to tell me stories about banging about on Kangaroos. The New Zealand forces didn’t operate them but Canadian or Scottish units used to ferry our troops into battle on occasion according to Dad. He said they were great for driving up to a house and being able to scramble through first floor windows. He was in one once that took a hit from a German tank, He said they saw it down the end of a street and the driver gunned it to get behind a house. He reckons the tank shell went through the house and still knocked them out. 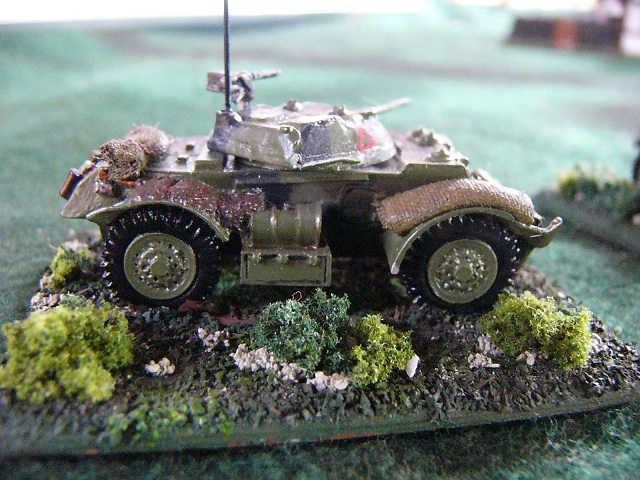 Anyways, here are a few shots of some Canadian Kangaroos (old white resin Battlefront that came in little card boxes). 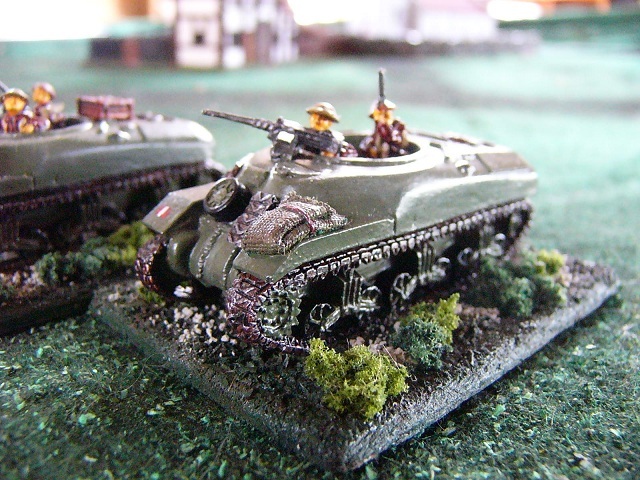 The infantry riding in these Kangaroos are Old Glory 15mm Bren Carrier Crews (Command Decision Bren Carrier Crew CDBC-07). Hope you enjoyed these miniatures, my tribute to Uncle Stan (Div Cav) and Uncle Bob (19th Armoured) and unknown members of the Canadian Army in Italy. They look great. I’m glad to see the conversions of the Stuart V worked so well.